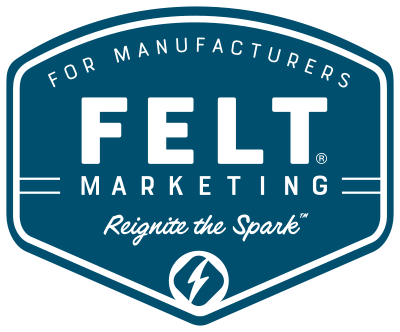 Why do YOU think more manufacturing leaders aren’t leveraging social media to make sales easier? PLANNING — going in half-cocked without a long-term strategy; peters out with no quantifiable results. SUBSTANCE — lack of meaningful Pillar Content; run out of things to say real quick. AUDIENCE — understanding what actually matters to buyers; only talk about the company, products, features and benefits. Endlessly talking about your features and benefits only taps into 5% of a buyer’s decision-making brain. (FIVE PERCENT) You also start sounding like that person who shows up at every party and only talks about themselves. Exit, stage left! 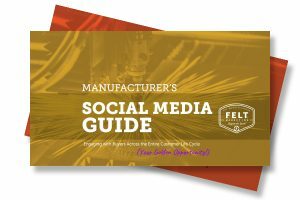 This is the very reason we developed the Manufacturer’s Social Media Guide. To make this whole social media thing easy and turn a challenge into an opportunity. Do more with less! Start leading the conversation and driving conversion before, during and after the sale. Or forward it to your in-house marketing team and let them have all the fun. This Social Media Guide is as exciting as picking up piles of money right off the sidewalk!. Make it easier to know and trust you. Connect with prospects faster. And, nurture customers during and after the sale. As a result, customers will be 300% more likely to recommend you. Consequently, the conversation is happening with or without you! Leverage social media and lead it. Start generating a bigger return now — on your investment, your innovation, and your influence. Go ahead and DOWNLOAD your free guide. Fat-free, yet filling! Grow your tribe and make sales easier. Need to improve your current social media strategy? We can help. Make sales easier. Schedule a 15-minute call.